Under tight timelines the TNPA is hosting a PEoples Port Festival on the weekend of the 25th and 26th of March 2017. 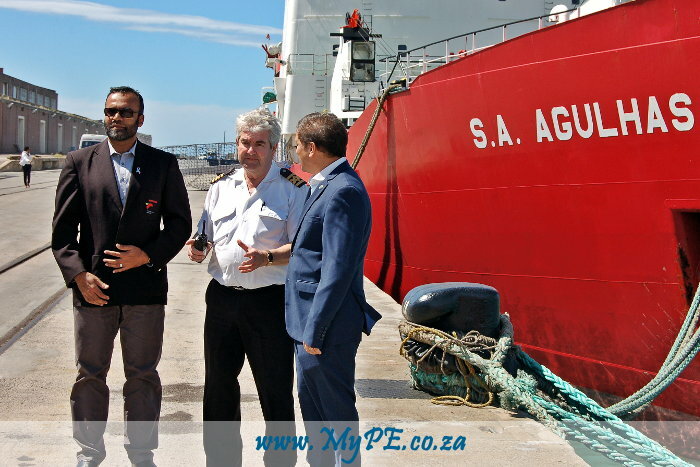 According to Port Manager, Rajesh Dana one of the reasons why the festival is being held is to dispel the myth that the port is a less than friendly place for the citizens of Nelson Mandela Bay. Security has been significantly relaxed since the establishment of the Shisa Restaurant and Dockside Entertainment Facility south of the Baakens River. The establishment of a security checkpoint north of the Baakens River re-affirms the demarcation of the leisure area from the high security aspects of the sprawling Port. At present the public have four restaurants to choose from within the ‘PE Waterfront’ area – The Chartroom (at ABYC), Up-The-Deck Restaurant at PEDSAC (Port Elizabeth Deep Sea Angling Club), Shisa Restaurant and Dockside. Add the two restaurants just outside the Port precincts at the Baakens Street entrance; This is Eat and Fishermans Fresh and the public have six very diverse eateries to choose from within a couple hundred metres of each other. The ABYC will be adding to the colour of the PEoples Port Festival during the weekend with dinghies and yachts sailing in mini regattas and directly before the fireworks display at 8:00 pm on Saturday various decorated craft will sail past the main stage area where Mafikizolo will be playing (free entry). Entry to the port will be from all three access points: Green, Strand and Baakens Streets. The main public parking area will be from the Green Street entrance to past the Port Admin Building. Shuttles will be available to transport festival goers to the festival. VIP parking will be accessed via the Baakens Street entrance. For those who are looking to escape from the crush of the crowds ABYC will be open to members of the public with Craft Beer Ben Koppen available from a unique, must see ‘bottoms up’ dispenser. Sip your beer on the lawns and sample the Chartroom Fare. Become a member of the club for a reduced membership fee on the festival weekend only. Braai packs are available and some lucky visitors will get to sail within the harbour. The Algoa Bay Yacht Club Deck will also offer a great vantage point for the Saturday 8:00 pm fireworks. Activities, demonstrations and entertainment will include: Automotive exhibition, Maritime careers exhibition, Ocean-based research in the Bay, Bayworld experiences, Virtual diving opportunities, Water sports, Family entertainment, Fishing Competition, Food Trucks, Ferry, Watersport, Sailing, Food Sheds, Pop Up Restaurant, SA Agulhas Tours, Double Decker Bus Tours, Free Live Entertainment, Soccer 3-a-side, Naval Tours, Fireworks, Screenings of the SAS Mendi Documentary, Fish Market …. All you need to pay for is your food and beverages.